1. Preheat the oven to 180°C, gas mark 4. Brush the outsides of the pittas with a little olive oil and sprinkle over the thyme leaves. Cook on a baking tray, oiled side up, for 15 minutes until crisp and golden. Remove and leave to cool. Cut 1 of the cloves of garlic in half and rub it over the pitta. Break the bread into large pieces and set aside. 2. 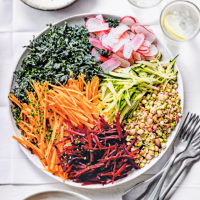 Place the beetroot, carrot, cavolo nero, courgettes, radishes and sprouts in separate piles in a large shallow bowl. Scatter the chives over the top. 3. Crush the remaining garlic cloves. Mix the tahini with 150ml boiling water until smooth. Add the garlic and whisk in the lemon juice then season. Dress the salad immediately before serving with the chips on the side.